Infinite Art Tournament: Arbitrary Travel, meet Fitness Kick! Fitness Kick, meet Arbitrary Travel! Arbitrary Travel, meet Fitness Kick! Fitness Kick, meet Arbitrary Travel! So I used Google Maps -- which is a pretty good maps -- to construct both an image copy and a paper copy of this map of the City of Roses' "Inner Southeast" and adjoining areas. The area I'm after stretches from the river (meaning the Willamette River, to you outsiders) to I-205, and from I-84 to south to Holgate Street. 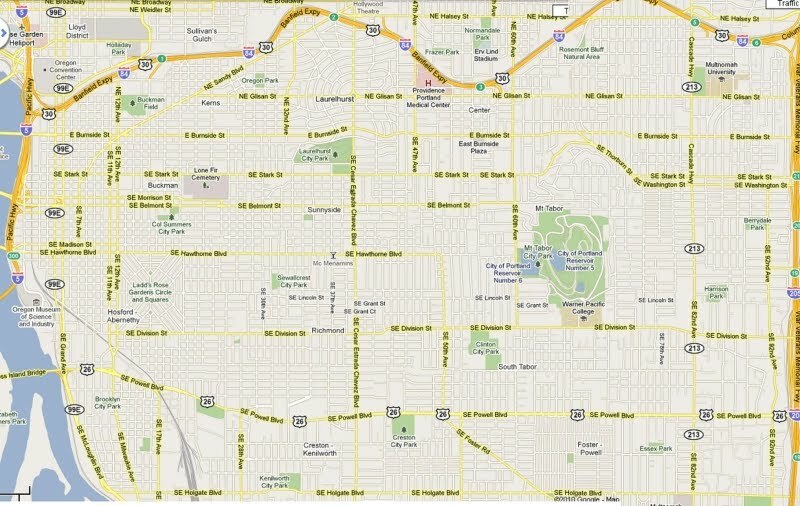 Castle5000 is very roughly in the center of this area. 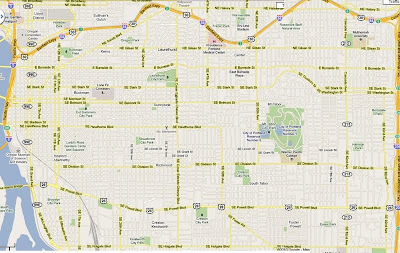 Except, the image is actually at this scale, because of course I need to be able to see the individual streets. 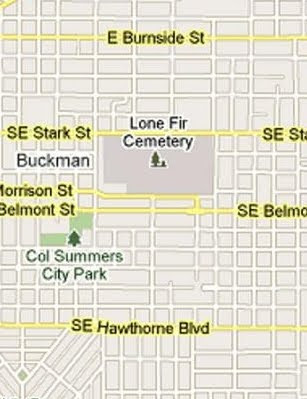 Here's a detail centered on Lone Fir Cemetery, where Mrs.5000 & I recently completed an excellent geohashing expedition! ...and I need to see the individual streets, of course, because -- do you see what's coming? -- I need to mark them off as I run them. All of them. As of this writing, I've gone running exactly twice "on the map," as it were, and it's interesting to see the unintended consequences of my decision on my behavior. For one thing, I found myself doing little detours down to the end of dead-end streets (which I ordinarily avoid, for obvious reasons), because hey, I'm going to have to take care of them at some point. Also, I have been running down busy, unpleasant streets to get them out of the way. And as I contemplate going for a run right now, when I finish this post, I'm thinking that I ought to trace a straight line right out to that perimeter and cover some ground there, since the stuff closer to home will pretty much take care of itself over time. In other words, the idea is already having its intended effect, knocking me out of the ruts and sending me into some new streets and unfamiliar neighborhoods. I'll report back on this project in the quarterly reports. Set Any New Records Lately? Why yes! Thanks for asking! Wednesday, the 28th: A solid run, 7.87 miles -- longest run of ALL TIME on the 28th!!! Also, longest run of all time on a Wednesday. Also, longest run of 2010 to date. * by virtue of taking a bicycle ride. ** hoo-boy, was that a soft record. Still is, actually. *** by virtue of going for a run. A good run, though. **** and I had actually ridden my bike on the 25th before! What a coincidence. I just finished updating some running goals of my own. I could get more personal bests if I used your methods. A still-new all-time spreadsheet is the best! Today's ride of 31.0 miles broke the previous all-time best ride for the 30th of a month by, um, 30.3 miles! Ooh! And it breaks the Friday record by 25 miles! Maybe you could renumber the year 1-365 instead of counting for each month when your record-setting pace slows down? Or use the French Republican Calendar--you'd be setting brand new records for Thermidor! Or Fervidor!